Last week, the graphic design experts at Deeyung Entertainment created a set of futuristic NFL helmets that Roger Goodell should make teams start using next season. The creative geniuses weren't done. 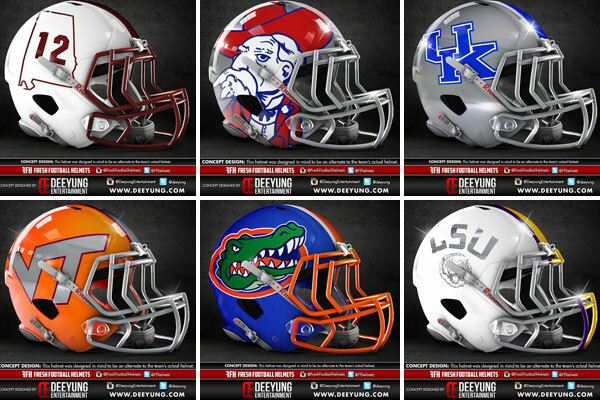 They came up with 60 futuristic college football helmets that are nothing short of incredible. Congrats to the students of Penn State who raised $13 million to help fight pediatric cancer during the annual THON dance marathon. Keith Olberman, however, was not impressed. Two Penguins fans named their baby Malkin Crosby Long. The internet reacted as you'd expect after hearing news of a baby named Malkin Crosby Long. I really wanted to feature Irina Shayk, Hannah Davis or Gigi Hadid today because of the classy yet revealing dresses they wore to the Oscar after-parties on Sunday. I am also tempted to show some love to Emily DiDonato, who is celebrating her 24th birthday. But I promised to avoid using SI Swimsuit models as LLODs for the next couple months, so you'll have to deal with Cindy Mello in lingerie instead. Hope you don't mind (click here for full-size gallery). Can't say enough good things about The Triangle Offense blog, which crunched a bunch of numbers and created this fancy infographic to show that the home teams win 66% of the time Rihanna attends a game. Lightning goalie Ben Bishop decided he needed a mask with actual luminescent lightning on it. And since it's 2015, he got his wish, thanks to designer Dave Gunnarsson. Do I owe Marshawn Lynch royalties for that headline? SVG lost keys, stranded at Palace after #Pistons beat #Wizards. Wife Kim had to come back and get him. Keys still not found. The Suns hosted a Star Wars Night for fans attending last night's game against Boston ... An agent explains the NFL Combine ... There may be a shorter MLB season in the not-too-distant future ... Michael Sam will be on the new season of Dancing With the Stars ... Las Vegas' quest to get a NHL team hit a snag when not enough people signed up for season tickets ... David Ortiz showed up to Red Sox camp in a Notorious BIG t-shirt ... DeAngelo Williams, who may hold the record for being on the most fantasy football teams, will not be with Carolina next season ... Harrison Ford skipped the Oscars to attend Sunday's Lakers-Celtics game ... The funniest memes from Parks and Recreation. The season finale is tonight on NBC ... A cop in Massachusetts found a $15,000 pearl in his soup. The best part of last night's Kansas-Kansas State game. This is about a week old but still cool. The referee's view of a goal by South Florida forward Stephen DeMarco. Julius Hudacek, who plays goalie for Orebro of the Swedish Hockey League, leads the arena in a Y-M-C-A sing-along during a game supporting LGBT. Kobe Bryant discusses his injury and the Lakers' losing streak during an appearance with Jimmy Kimmel last night. Click here for previous versions of Hot Clicks, visit our Extra Mustard Page every day for more quirky sports stories and the latest Cheerleader of the Week gallery, and please take a look at The Daily Cut, our new live and on-demand video platform.